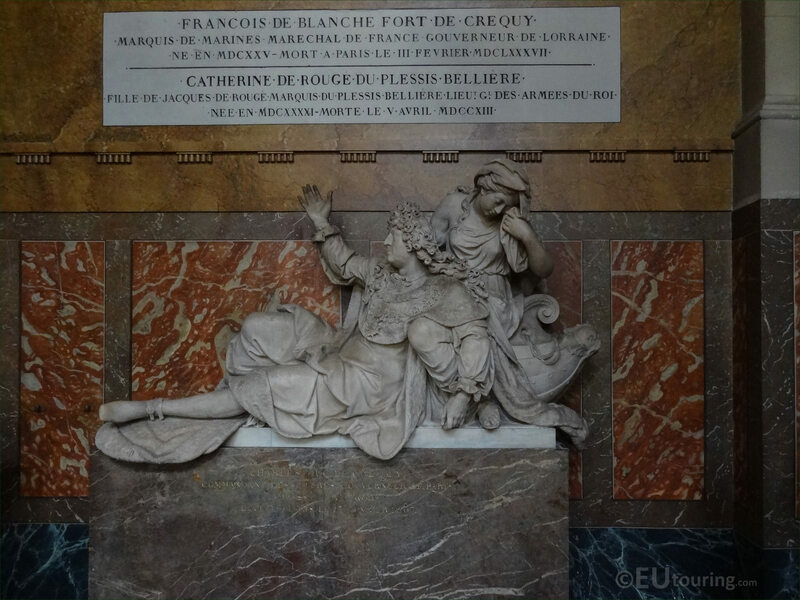 We were at the Eglise Saint-Roch in the 1st Arrondissement of Paris, when we took these high definition photos showing the Monument to Charles, Duc de Crequy and his family, which was sculpted by Pierre Mazeline and Simon Hurtrelle. This first HD photo shows a tomb and funeral monument dedicated to Charles III de Blanchefort-Crequy, known as Charles, Duc de Crequy, along with recognition and a plaque for his son Francois de Blanchefort de Crequy and his wife Catherine de Rouge du Plessis Belliere. They are all now entombed within a chapel in the Eglise Saint-Roch called the Chapelle Saint-Etienne, and you will find that this is located on the right hand side of the church as you have entered from the Rue Saint-Honore, although the original funerary monument was purely dedicated to Charles III, Duke of Cliquy, who was born in 1624 and passed away in 1687. Charles de Crequy was a Lieutenant-General of the Kings Armies, became the Governor of Paris and was an Ambassador to Rome, who was one of the great dignitaries under the Regency of Anne of Austria, and during the reign of King Louis XIV, who was originally buried in the former Eglise des Capucines, which was destroyed during the French Revolution. The Monument to Charles, Duc de Crequy was designed by Jules Hardouin Mansart, for a chapel dedicated to him that was decorated by his widow within the Eglise des Capucines, and she entrusted the sculptural work to Pierre Mazaline who was born in Rouen in 1633 and was a member of the Royal Academy of Painting and Sculpture. However, he was also assisted by Simon Hurtrelle, who was born in 1648, and also becoming a French sculptor, both of these gentlemen worked on royal residences such as the Chateau de Versailles at the same time, plus they also both worked for Les Invalides, which King Louis XIV founded. So this statue group is depicting Charles, Duc de Crequy wearing a costume of the Order of the Holy Spirit, and a woman in tears seated at the prow of a ship, as an allegory representing hope or expectation, although many feel this is an allegory to represent the City of Paris, of which he was a governor. 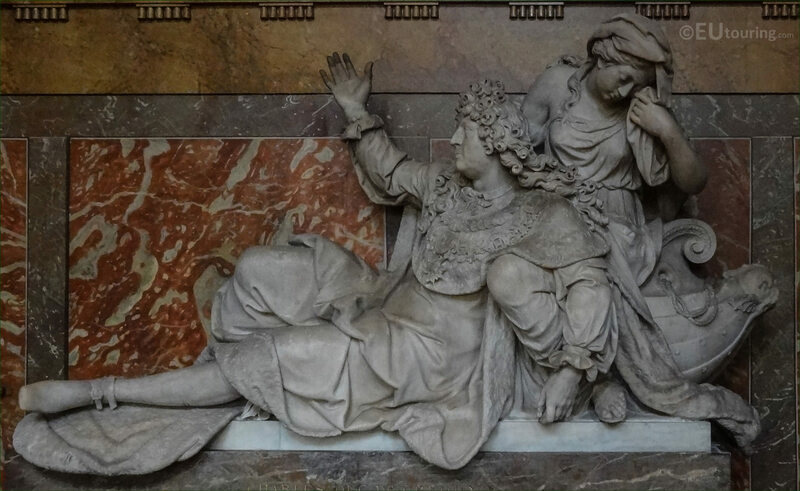 Now here you can see the tomb itself, or sarcophagus, below the white marble statue of the Duke of Crequy and produced in black marble it has an inscription relating to Charles, Duc de Crequy as Governor of Paris, along with his exact date of death being 13th February 1687. However, when the monument was first designed and executed by Pierre Mazaline and Simon Hurtrelle, there were also two additional statues located either side of the sarcophagus that were female figures as allegories representing Religion to the left with a crucifix, and Liberty to the right with a cornucopia, yet these, along with the main statue group ended up within the Musee des Monuments Francais in 1798. It was between the years of 1804 and 1809 that the statues of Liberty and Religion were attributed to the Eglise des Invalides and placed within the chapels called the Chapelle Saint Gregoire and the Chapelle Saint Augustin, which is where they remain today, yet in 1819, the remainder of the Monument was transferred to the Eglise Saint-Roch and placed within the Chapelle Saint-Etienne. 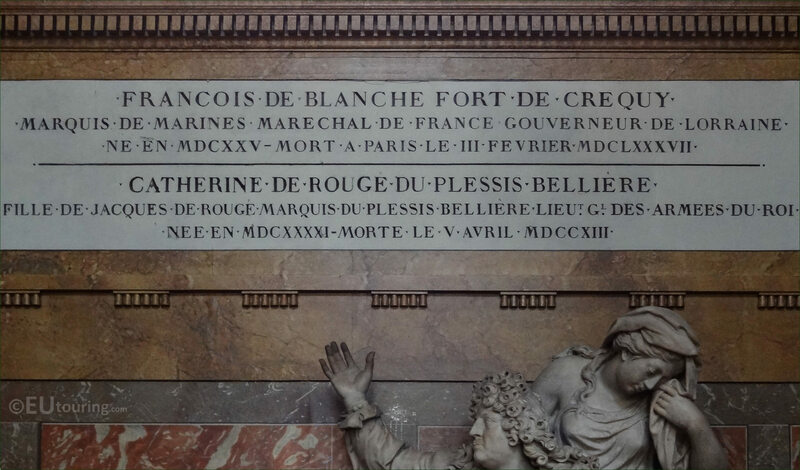 Yet this photograph show the dedication plaque to the son of Charles III, Duc de Crequy, Francois de Blanchefort de Crequy who was Marquis of the Marines, a Marshal of France and a Governor of Lorraine, who was born in 1625 and died in Paris on 3rd February 1687, which is shown in Roman numerals. The second dedication on the plaque shows Catherine de Rouge du Plessis Belliere who was the daughter of Jaques de Rouge, Marquis du Plessis Belliere and according to our research she was the spouse of Francois de Blanchefort de Crequy, who was born in 1602 and died on 5th April 1687, yet her year of birth and death are 1641 to 1713 according to some sources. 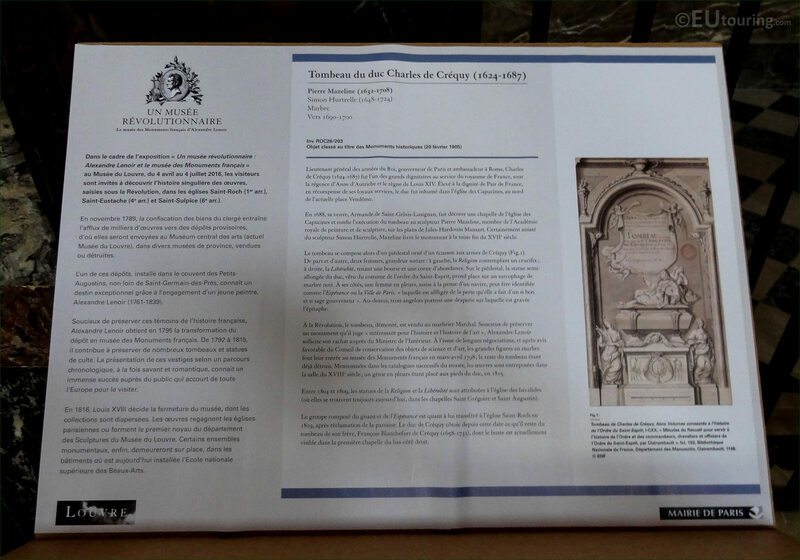 But this photograph shows the tourist information board that was positioned in front of the chapel within the Eglise Saint-Roch that was part of an exhibition run in co-ordination with the Musee du Luvre and the Mayor of Paris, which provides far more details about the Monument to Charles, Duc de Crequy. And as you can see form the image above, this was classified as an historical monument on 20th February 1905, even though other parts of this original funerary monument by Pierre Mazeline and Simon Hurtrelle are still within the Eglise des Invalides, although, if you can read French, then there is still even more to learn about this exceptional piece marble statue group.